On paper, it sounds like a dream come true. 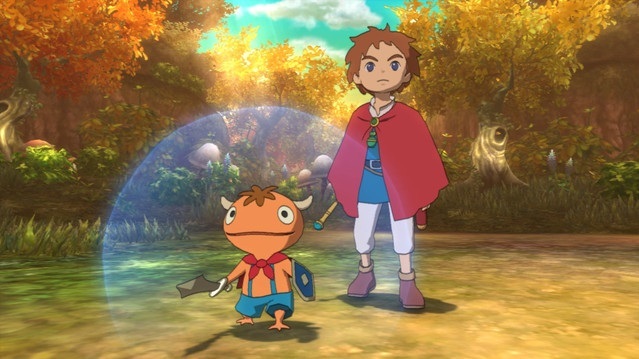 Imagine a game that takes the best parts of Dragon Quest, Pokémon, and Harry Potter, and puts them all together with a coat of paint applied by the masterful talent at Studio Ghibli and the experienced developers at Level 5, and you will end up with Ni no Kuni: Wrath of the White Witch. How could such a formula result in anything less than greatness? For the most part, it can’t. 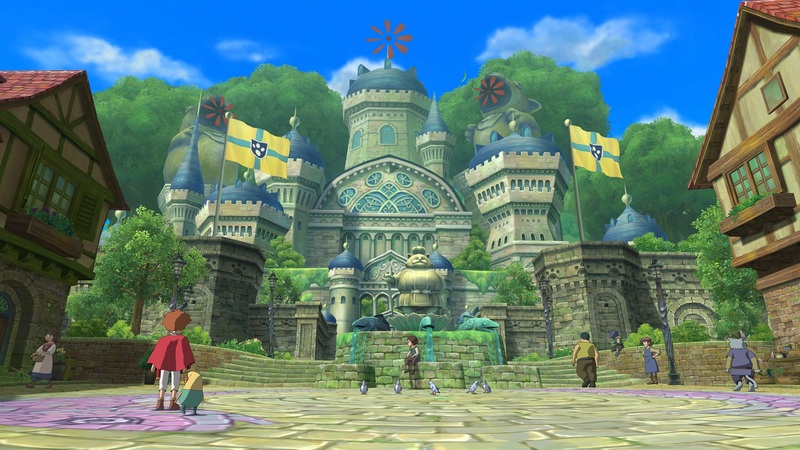 Ni no Kuni does so much right that it’s hard to even admit that flaws exist in the game. And though numerous flaws do exist, nothing can stop Ni no Kuni from telling its story and providing a great deal of fun, entertainment and emotion along the way. Studio Ghibli is no stranger to emotional storytelling, as anyone that has seen My Neighbor Totoro, Spirited Away, Grave of the Fireflies or any of their other films might tell you. There are surprisingly powerful emotional moments throughout not only the main storyline of Ni no Kuni, but also in some of the smaller stories that occur in the game. There is also a collection of very well written in game fairy tales which manage to provide emotional payoff when least expected to those who take the time to read them, and also help to further express the world in which they exist to the player. 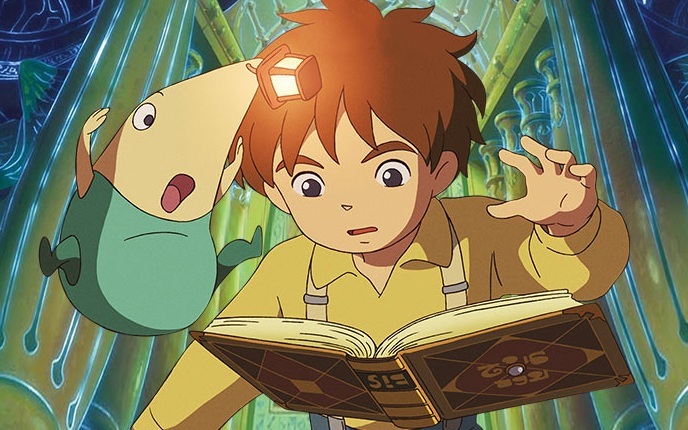 As in many of Studio Ghibli’s films, the setting of Ni no Kuni is a world of fantasy and unbridled imagination. The places, the characters, and the overall setting ooze charm and creativity. You can feel the presence of Studio Ghibli in nearly every aspect of Ni no Kuni, from the obvious, like the artwork and animation, to the more abstract, like the simple feeling you get as you wander the world they have created. It’s appropriate that Ni no Kuni means Another World (literally: Second Country), because that’s exactly how I would describe what it’s like to be enveloped in the atmosphere of a Studio Ghibli production. They can take you away, if you are willing to suspend your disbelief and follow them on an adventure. The adventure of our main character, Oliver, is much the same. When a tragic event forces him away from his peaceful life in a relatively normal town called Motorville, he finds himself journeying through a world where magic is not only something that exists, but is also something that he is capable of learning and mastering. It’s a world where creatures called familiars can be trained to protect their masters, and where the emotions that exist in a person’s heart can be stolen away, leaving them brokenhearted and incapable of kindness, courage, or a number of other traits that reside in the heart. Oliver takes it upon himself to help those brokenhearted individuals, and in doing so, gets closer to discovering the villain responsible, and the truths that he seeks. It is a childish game in many ways. Oliver is as innocent as can be, a pure hearted boy who says things like, “Jeepers!” when he is surprised, and who would do anything he could to help someone in need. The familiars (or monsters) in the game are cute and fairly non-threatening and even the bosses are mildly scary at worst. Ni no Kuni was rated E10+ by the ESRB, and adheres to its rating unfalteringly. Though there are of course a fair share of innuendos, subtleties and even an abundance of disguised profanity (courtesy of a hilarious sidekick character called Drippy) that an adult player might appreciate, overall it still feels like a kid’s game. It looks like one too. 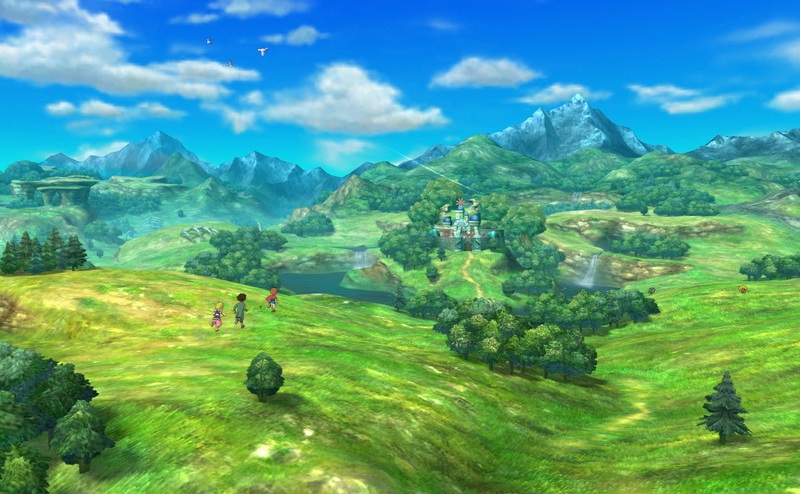 The artistic style of Studio Ghibli fills Ni no Kuni with bright colors, adorable characters and vibrant landscapes. But, childish or not, the visuals are breathtaking. When Oliver takes his first steps into the new world, the player steps with him, and there is a sight to see in every direction. There are hilltops covered in grass waving in the breeze, dense forests, rivers, lakes and waterfalls, plateaued hills and jagged mountain ranges, and a castle in the distance. It’s all just begging to be explored, and it looks fantastic. It’s a game that proves how an artistic concept can overcome the limitations of hardware and that games don’t need to be realistic to look amazing. You will want to get lost in this world that Studio Ghibli and the developers at Level 5 have created. Rounding out the visuals is an orchestral soundtrack that suits the game perfectly. Much like Dragon Quest VIII (also developed by Level 5), it makes you wonder why more games don’t make use of live recorded music. The greatest compliment I can give the soundtrack is that I found myself remembering some of the melodies even when I wasn’t playing, and humming along while I was. My only complaint is the music that players during combat is a bit annoying, and is repetitive enough before you take into consideration that you are likely to hear it (or at least the beginning of it) over 1000 times before you have completed the game (you will earn a trophy when you survive your 1000th battle, by the way). 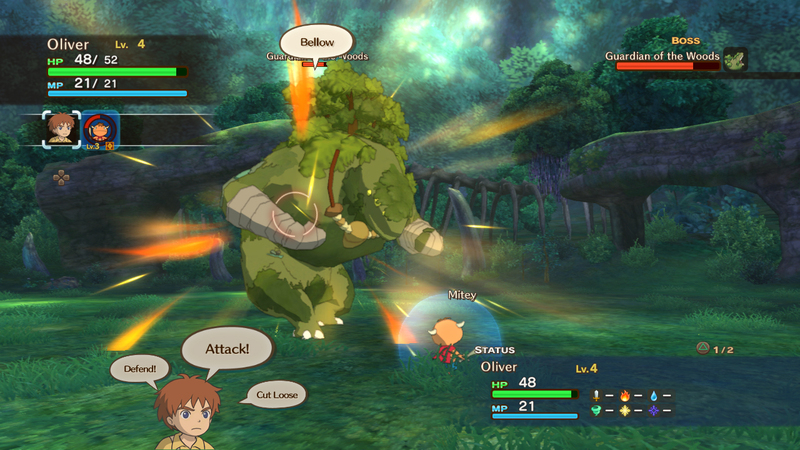 Outside of exploration, battles provide the majority of gameplay in Ni no Kuni. Combat occurs in real time and pauses only when selecting abilities or items to use. The player can manually move the controlled character—either a main character (like Oliver) or a familiar summoned by that character—around the battlefield, and enter commands from a rotating menu in a similar manner to most JRPGs. This menu is actually fairly imprecise compared to a traditional list-type menu, and can be irritating when combat gets intense and there is not a lot of time to make selections. 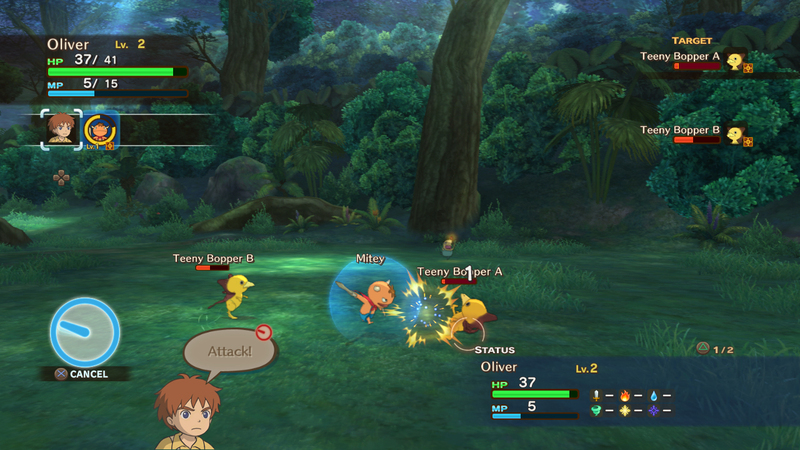 Combat in Ni no Kuni starts out simple, with only a single controllable character and one or two enemies, but eventually evolves into a quite hectic system where the player must switch between three characters (or one of three of their familiars) while fighting several enemies at once. Selecting attack or defense will make the controlled character do just that (and take movement control away from the player), but only for a few seconds. The command must then be selected again. There are some nuances to this system. For example, if the player selects “Attack” at the exact moment an enemy attacks the player, there will be a counterattack that can cancel the enemy’s attack or ability. I imagine that this is the reason that there is a cooldown on these basic abilities. If you initiate an attack, but then cancel it, it will be a few seconds before you can attack again. This applies to defense and familiar abilities as well. Unfortunately, there are frequent circumstances where you will want to select “Defense” and the option will not be available in time to be of any use. Trying to strategically switch between offense and defense often results in neither being available. The battle engine is riddled with problems like these which are at the very least inconvenient, if not downright frustrating. It is in combat that Ni no Kuni shows its greatest weakness. Too Much Artificial, Not Enough Intelligence. The most obvious offender is the AI that controls whichever character(s) the player is not controlling. There is a menu to determine the behavior of those characters (which oddly, cannot be manipulated outside of combat), with choices like “Do What You Like,” or “Give It Your All.” I’ve played through the whole game, and I honestly still don’t know the different between those two, or the difference between “Provide Backup,” and “Keep Us Healthy.” All 4 of those might as well be, “Waste All Your MP,” which is basically what the AI will do on any setting aside from “Don’t Use Abilities,” or “Don’t Do Anything” (which ironically, is the most useful out of the bunch). Sadly, no combination of settings will ever get the AI to use their MP conservatively, and so the only choice is to prevent them from using abilities at all, or to double back to a save point (which recovers all the party’s HP and MP) when those characters inevitably run out of MP. There is also a choice for the AI to attack the player’s target, a different target, or the weakest target, but unfortunately, that choice applies to both AI controlled characters and cannot be designated individually. Beyond that, there are also a couple of AI overrides (that unlock a bit further in the game) that are available during combat called, “All-Out Attack!” and “All-Out Defense!” Activating one of these will basically tell the AI to ignore its settings and focus exclusively on offense or defense. But once again, the system’s limitations become apparent as the AI will frequently ignore the order to defend or make foolish decisions when told to attack. Given that it is impossible to control more than one character at a time (a feature that could have been a fun way to include multiplayer in Ni no Kuni), you are forced to rely on the poor AI. And poor it is! It will constantly make terrible decisions, like standing still instead of trying to get away while low on HP and near enemies, or casting a heal spell right after you just filled up your HP with a spell of your own, or smacking an enemy with a melee attack for 1 damage instead of switching to a melee proficient familiar, or wasting MP on a powerful attack to kill the last remaining enemy that could have been defeated with a simple strike, or standing in the fire. It burns! The AI isn’t completely incompetent. It is capable of choosing not to attack a sleeping or confused foe, for example. But this is a small condolence to the player staring at the game over screen because the AI did something ridiculous. Ni no Kuni really could have benefited from something similar to Final Fantasy XII’s gambit system, which granted the player astonishingly precise control over the behavior of AI controlled allies. Outside the AI, there are still more problems with the battle engine. The interface only displays the MP of the player controlled character, and will not show the rest of the party’s MP unless selecting a spell or item that targets them. As a result, you won’t know when your AI controlled healer is out of MP, which can often lead to catastrophic consequences. Though the visuals during combat in Ni no Kuni are as breathtaking as the rest of the game, there are several problems with spell and ability animations that might leave you too annoyed to appreciate the artwork. During these animations, you cannot control the camera, and some of them leave the camera aimed away from the action, forcing the player to rotate it all the way around after the fact. In the time it takes to play cameraman, it is pretty likely that the enemy will use an ability that you will not have time to notice or defend against. There is a small graphic that appears over your character when it is targeted by the enemy, but it is hard to tell whether the oncoming attack will be severe enough to warrant switching to defense or not without seeing the name of the ability the enemy is using. Even worse, many spell and ability animations stop the action entirely, with several adverse effects. First, the command wheel vanishes during the animation and does not remember your choice when it reappears. Second, if you had already chosen to use a spell, ability or item before the animation started, it’s very possible that your choice will be completely forgotten and never take place. Third, and worst of all, is that sometimes the game will still consume the MP or the item that you used without ever granting its effect! The battle system in Ni no Kuni is plagued with constant interruptions. It often makes reviving fallen party members or healing them on time impossible, and is absolutely infuriating during boss encounters, or encounters that make frequent use of such animations. One unique aspect of the battle engine is that during combat, small balls of light called glims will appear from time to time. When collected, these will restore HP or MP, and in the case of the golden glim, will grant the character that retrieves it an opportunity to use their ultimate attack. This is another frustrating system, because the appearance of golden glims is quite random and rarely occurs at a convenient time for the player. And beyond that, when a golden glim is collected, the regular command wheel cannot be selected at all, preventing the player from saving the ultimate attack for later or prioritizing a different ability such as a heal. Still, glims do provide a small source of healing that can be helpful, and they can also delay how long it takes for the AI to waste all of their MP. In rare cases, they can be the difference between victory and defeat. Defeat will come from time to time. Most basic battles throughout the game are not very challenging, but the boss battles quickly escalate in difficulty, especially if playing on normal. 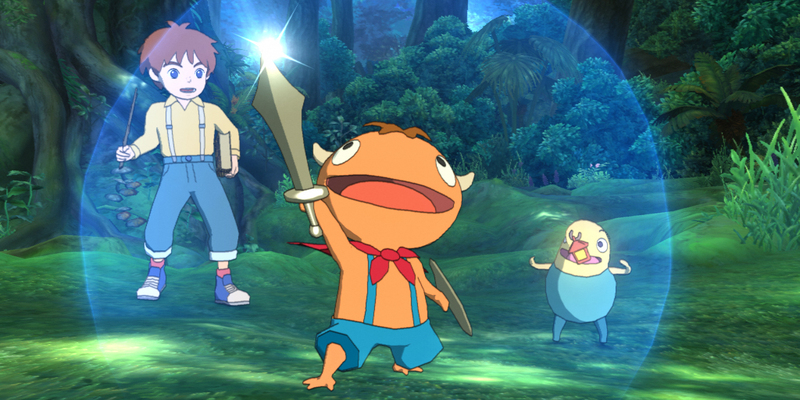 If Ni no Kuni is a kid’s game, it certainly isn’t an easy one. The game over screen features an option to continue that takes away 5% of your guilders (currency). That can be convenient when defeated by a random encounter since you can keep the experience and items that you’ve earned since your last save, but it’s entirely useless during boss battles. There is always a save point right before a boss, so the game is basically asking you if you want to pay 5% of your guilders to go back to the save point, of if you want to go back to the same exact save point from the title screen for free. You’d have thought during multiphase encounters that you could at least continue the battle from the phase you were defeated on, but, frustratingly, that is not the case. It’s really unfortunate that the battle engine is so flawed, because not only is it beautiful to watch, but there is a fantastic system in place for players that want to explore its depths. Anyone that has been addicted to Pokémon will find themselves in familiar territory here. There are over 300 familiars that can be tamed and used in combat, each of them with a specific list of abilities to learn and different strengths and weaknesses. This is another part of the game where Studio Ghibli shines through. The familiars have personality and character that is endearing and entertaining. The look of them and the sounds that they make come together magically, and it’s easy to get attached to the little guys as you develop them, which adds to the fun of trying to collect as many as possible. Familiars gain most of their strength through a traditional JRPG leveling system, but you can also feed them treats to increase their attributes. Feed a familiar enough chocolate and its physical attack power will increase. There is a different type of treat for each attribute, and each familiar has a favorite that will grant twice as many points towards an attribute increase when fed. Familiars will eventually become too full to eat anymore treats, but a few rounds of combat will bring a return to their appetites. By default, you can only increase attributes by a combined total of 10 points, but if you feed enough treats to a familiar, it will gain “familiarity,” which will eventually allow as many as 50 points to be rewarded. That really isn’t that much, and represents about 5% of the total stats of a level 50 familiar, but it’s still better than nothing. Then again, the process of feeding the familiars is rather time consuming. For some reason, you can only feed a familiar one treat at a time. I wish I could have just fed my hungry familiar 10 chocolate bars at once instead of waiting through 10 feeding animations. It may not seem like a big deal, but eventually you will have 15 familiars in your party at a time, and feeding them all is tedious, especially given the rarity of higher quality treats, which provide better bonuses and cause the familiars to become full quicker. It also would have been nice if there was a treat specifically for increasing familiarity, since it is not uncommon to be capped on attribute bonuses long before familiarity has increased enough to allow more of them, forcing you to waste treats without getting any bonuses. Familiars can also gain strength through metamorphosis. Once they have reached a high enough level, they can be fed a special treat that evolves them into a stronger version of the species that is capable of learning new skills, but also reduces their level to 1. Each base species can be metamorphosed into a 2nd stage and then again into one of two 3rd stages. Basically you will need at least two of each familiar to earn every species in the game through metamorphosing. 2nd and 3rd stage familiars do appear in the wild, however, so they can be tamed that way as well. Taming familiars is simple enough to understand, but annoyingly inconsistent in practice. Occasionally during combat, a defeated familiar will return to its feet with little hearts floating around it. This indicates that it is ready to be tamed, and the tame command will become available to one of your characters. The trick here is switching to that character before accidentally attacking the familiar again. Sometimes you will be so caught up in combat that you will accidentally attack it yourself, and other times the AI will use an ability that damages all enemies before you can tame the familiar. Given the excruciatingly low odds of a creature becoming tamable to begin with (even after earning a bonus to the tame rate), it is immensely frustrating to miss your opportunity to catch one; especially if the creature needs to be tamed for one of the Ni no Kuni’s many side quests. The more I played, the more I found myself wishing for Pokéballs. Eventually you will have too many familiars to bring with you, so as many as 400 of them can be stored away at the Familiar Retreat. It’s a very convenient storage system that lets you sort your familiars by level, name or genus. The main problem with it is that although it shows your battle lineup, it does not show your characters’ favorite genuses. Matching a character to a familiar of a favored genus provides a 10% increase in all of that familiar’s attributes, so it’s pretty important. But the only way to match them up properly is through the Friends & Familiars menu, which requires leaving the Familiar Retreat to access. But all and all, it’s a very handy system, and is useful for retrieving familiars necessary for side quests or just amassing a huge collection. And speaking of side quests, Ni no Kuni has a ton of them. There’s a coliseum style battle arena with a series of progressively more difficult challenges that will keep players coming back long after finishing the game, a casino with four different games and a variety of prizes, several dozen bounty hunts, and a huge list of errands that involve everything from simple fetch quests to helping the brokenhearted. The errands do get a bit repetitive, as many of them require very little effort, but they still provide something to do when taking a break from the main storyline. The cool thing about the side quests is that they usually involve recurring characters that are actually interesting to get to know. You end up helping the same people over and over again, and by the end of the game, these unimportant characters are surprisingly familiar and interesting. Some of the tasks are amazingly frustrating though, especially the ones that expect you to tame specific familiars. Given Ni no Kuni’s low tame rate, each time a side quest like this comes up, you can expect around an hour of grinding or more if you are unlucky. Also, bear in mind that a metamorphosed version of a familiar will not count if the side quest requires the base species. I had to tame some familiars I had already obtained because of this. There is also an alchemy system in the game, with over a hundred combinations of items to create, ranging from weapons, armor and accessories to consumable items. A few of the side quests involve alchemy, and it is a useful tool for upgrading your gear. Most of the recipes require rare items, however, so expect to do some scavenging if you want to fully take advantage of it. Also, the NPCs that provide new formulae are often random townsfolk with no other significant purpose or any indication whatsoever that they should be important at all. If you’re serious about alchemy, talk to everyone. Then of course, there’s the daunting task of trying to collect as many familiars as possible. You’ll need to tame 250 different species if you’re going for the trophy. To you completionists out there: good luck. In all my time with the game, I only tamed 138 species. To help you keep track of everything there is to do, Ni no Kuni provides a couple of great resources. There is a creature compendium which lists every type of familiar you have encountered, whether or not they have been tamed or defeated, details of where to encounter them, the items they carry and the abilities that they can learn. And then there’s the Wizard’s Companion, an amazing 340 page in game book that includes 7 chapters covering magic, alchemy, equipment, provisions, creatures and familiars, regions of the world and the previously mentioned collection of fairy tales called the Twelve Tales of Wonder. 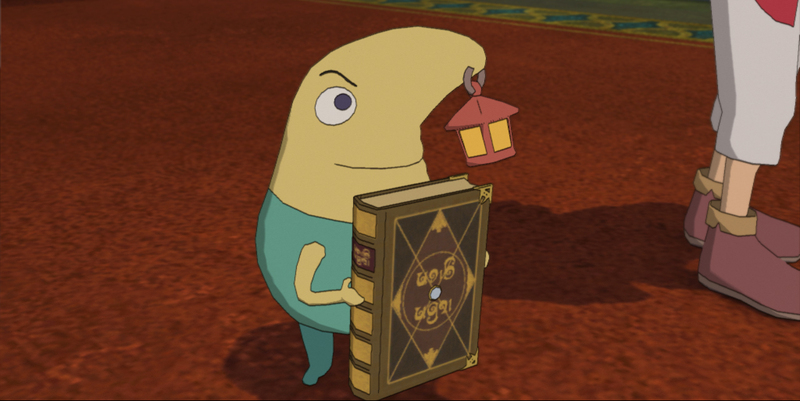 Referring to and reading from the Wizard’s Companion throughout the game was an absolute pleasure, and further absorbed me in the world and lore of Ni no Kuni. There were even a couple puzzles in the game that required a bit of research to solve! I could see myself spending hours perusing the pages of this book. Speaking of hours, Ni no Kuni is a fairly long game. Although I’ve heard reports of people completing the main storyline in 40 hours, it took me closer to 58, though I had done all of the available side quests up until the point that I finished the game. I do tend to put off the main storyline for as long as possible when I play RPGs. Postgame content (which includes harder versions of every major boss in the game) kept me busy all the way to the 79 hour mark when I finally gave up on the 3 or 4 trophies I had not yet acquired. The main reason I chose to stop playing is that the battle engine was not fun enough to compel me to continue collecting familiars. In fact, it was a strong deterrent throughout my whole experience with the game. But there is so much that is great about Ni no Kuni that it was worth tolerating a few annoyances and inconveniences. It’s worth mentioning that Ni no Kuni features both hand-drawn animation by Studio Ghibli and scenes rendered in real time within the game’s engine. What’s amazing is how well the rendered scenes are animated. It’s kind of bizarre when comparing the two techniques side by side, because on one hand you have the hand drawn animation, with its detailed expressions, but a somewhat choppy feel to it, and on the other you have the real time scenes, running smoothly at 60 frames per second, and looking quite wonderful. There is also a fair amount of voice acting adding to the experience. I played using the Japanese voices (I would make the same choice for any of Studio Ghibli’s movies), but I watched a few scenes with the English voices as well, and they were not only competent, but were also really funny and enjoyable. Expect to laugh out loud a few times while playing Ni no Kuni, and don’t be surprised to lose a tear or two as well. The exceptional storytelling, the beautiful animation and art, and the world that just begs to be explored are all reasons that every fan of the genre should jump in head first. Yes, there are problems that prevent it from achieving perfection (if such a thing truly exists in gaming), but there are aspects of this game that are unique to it, and should not be missed. It may not be a dream come true, but it is a dream worth dreaming. + List of dungeons shows whether or not all treasures have been found and opened. + Every visual aspect of the game: the art style, the animation, the world itself. + Wizard’s Companion is an amazing resource and provides wonderful detail about everything in Ni no Kuni. + Orchestrated soundtrack filled with memorable pieces. + Tons of creative characters that are a joy to get to know. + Huge collection of familiars to tame and battle with. + The Studio Ghibli feel of the game. -Bugs, like a boss that completely stopped attacking and just stood there until it was defeated. -The player learns several spells that can never actually be used in the game. After learning the spells, it was quite disappointing to never turn into a cat or a fish. -Backtracking is frequently necessary for side quests and to open locked treasure chests. -The teleport spell could have been given to the player earlier in the game. This is a tricky font to read on the white background; it’s too spindly. Thanks for the reply! We’re actually working on the legibility of the site, but I hope that you were still able to read the review! If you are having a hard time reading the text, try setting the character encoding in your browser to Unicode (UTF-8). Very informative review Ari, I will be purchasing Ni no Kuni after I finish up Final Fantasy XIII-2, which shouldn’t be too long. This sums up my feelings about the game almost exactly. I’m about 30 hours in, and almost all of my gripes come from the poor AI and somewhat infuriating battle system. I’ve found a significant difference between “Do What You Like,” “Give It Your All,” “Provide Backup,” and “Keep Us Healthy.” While all of them do lead to Esther immediately using all of her MP, Keep us Healthy is the best setting for a singular fight, as she will focus entirely on healing, while provide backup seems to prioritize healing/buffing, and do what you like seems to mean waste mana on whatever ability. The lack of control over the battle system (and the fact that metamorphosizing familiars forces them back to lvl 1) puts a huge stress on grinding. You can’t really use your skill to overcome bad situations, you have to grind until you can coast through them. Strangely enough, one of the game’s saving graces is that you can get a lot of that grinding done doing some of the more ill conceived side quests (the familiar taming ones, or the ‘cast x on creature y to receive item z’ – which is infuriatingly difficult when you go back to do it and the thing you need to fight in the wild runs way faster than you and away from you because you’re higher level). It’s really a testament to the story, the art, the music and the voice acting that I stuck with a game that needs grinding with a fighting system that falls just short of fun.